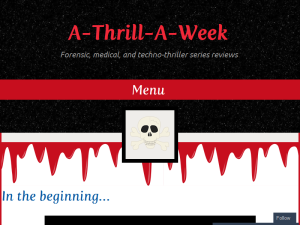 This what your A-Thrill-A-Week Blog Ad will look like to visitors! Of course you will want to use keywords and ad targeting to get the most out of your ad campaign! So purchase an ad space today before there all gone! Toni Dwiggins has recently released the fifth book in her Forensic Geology series, River Run. This is an unique forensic thriller series in that the forensic sleuths are geologist. The latest addition takes us into the heart of the Grand Canyon. Forensic geologists Cassie Oldfield and Walter Shaws investigate one way: trouble on the canyon’s Colorado River. Stranded raft. Life vests unused. Rafters missing. The only clue to the fate of the rafters is a bag of pebbles caught by the bow line. Following that clue, the geologists uncover a hellish scheme. Not only are the rafters in peril, but the river itself is under attack. The race to stop it takes Cassie and Walter deep into the canyon, and onto the mighty river, putting their own survival at stake. The focus of my blog is to review book series and not individual novels. But writers are going to continue writing novels within a series even after I have done my review, so I plan on reviewing the individual novels as they come into circulation. Simon Beckett has recently added book #6, The Scent of Death, to the David Hunter series. There is nothing more wonderful for a thriller enthusiast, such as myself, to have the setting of a thriller to take place in a creepy psych ward or dilapidated hospital. Luckily for me, Simon Beckett’s the The Scent of Death does just that with an abandoned hospital know as St. James located in London, England. The remains of four bodies are found at the hospital just as it was destined to be torn down. Our hero, forensic pathologist David Hunter, is called in to take a look at the first victim that was found. When an unexpected accident happens while on the scene, a hidden room is exposed with two more bodies. Since it was unclear whether the two additional corpses were related in their deaths to the first body found, a second forensic expert is called in. Daniel Mears, who calls himself a forensic taphonomist, is young and arrogant and soon becomes a thorn in David Hunter’s side. As in any good thriller, not everything in the The Scent of Death is as it seems and St. James and its morbid occupants will become a nightmare for Dr. Hunter that he will not soon forget. I would have to say that the The Scent of Death now tops my favorite for best in the series. The addition of more forensics than previous books in the series as well as the creepy hospital setting earns the The Scent of Death an A+ rating. The The Scent of Death could easily be read as a standalone novel but for fans of the series, Beckett revives an old nemesis from one of Hunter’s past cases. It will make you want to reread Written in Bone all over again. To learn more about the series check out the David Hunter series here. In a world of Obcasus, no war is safe. The United States has reached a level of darkness unmatched in years prior. When Bryan Powell issues a universal death penalty for all living Inexorables, costs mount to terrifying proportions for the cohort. War or surrender is inevitable. The only problem? The darkness is as much inside of A.K.’s own mind as it is in the outside world. Plagued by memories of the past and audible hallucinations, A.K. is as much a threat to the revolution as he is an ally. If the cohort wants any hope of survival, sacrifices must be made, lies must be told, and betrayals must be confronted head-on. Victors of Liberty is the final book in the Children of Wrath Trilogy. San Francisco medical examiner Annabelle Schwartzman has spent eight years looking over her shoulder. Stalked by her vengeful ex-husband, Spencer, she’s always known they’d meet again. Has her nightmare come true? Abducted, blindfolded, yoked, and tethered, she’s being held prisoner in an isolated cabin in Idaho. But it’s the unknown that terrifies Annabelle now. Because the man’s voice in the dark, though eerily familiar, is not Spencer’s. Annabelle’s partner and lover, Inspector Hal Harris, knows in his gut that Annabelle’s disappearance is tied to the past. Except Spencer is fifteen hundred miles away. To save Annabelle, Hal is tracking every move Spencer makes. But is it drawing him closer to finding Annabelle? Or is it luring him farther from her desperate cries for help? As a cruel game of retribution begins, Annabelle must rely on her wits, her will to survive, and a plan of escape. But time is running out. And her captor’s three chilling words make her fear that the worst is yet to come: sweet dreams, Bella. War has come to the darkest depths of the deepest oceans. Mayor Truman McClusky of Trieste City is at war with the world’s superpowers. Laying claim to the resources of the ocean and its floor is the only way to survive in a world where Global Warming and rising sea levels ravage the surface. But when a Trieste City spy ends up dead―his body beaten beyond recognition―Mac realizes that his city is in mortal danger. The occupying force in Trieste knows more about his plans for independence than he thought, and they will stop at nothing to control Trieste and her people. Mac flees with a small team that includes scientist and newcomer to the underwater city, Dr. Manesh Lazlow. Together they head for a secret base in the Mid-Atlantic Ridge where they plan to create new technologies to fight the superpowers for dominance over the oceans. But the French have picked up Mac’s scent and will stop at nothing to kill him. Mac must elude the French, protect his citizens against sabotage and spycraft, and discover the identity of a spy in his midst if he is going to save his city and compete with the superpowers. But he’s just a tiny player in the grand scheme of ocean politics. . . .
. . . unless he can get his new deep-sea engine working. With it he’ll be able to forge deeper than any other sub in the oceans. And if that happens, then all hell is about to break loose. The world is losing hope. Political and social infighting threaten to destroy the world. Rancor and hatred only grow stronger, engulfing nations around the globe. And each day moral and economic strife brings embroiled countries ever closer to war. But hope is not dead. Everywhere, pockets of human kindness and compassion continue to persevere. Where lives are cherished and virtue endures. And one small, extraordinary group fights to save us all. A team in possession of the mother of all secrets. The one secret – the one discovery – that could bring the world back from the brink. The focus of my blog is to review book series and not individual novels. But writers are going to continue writing novels within a series even after I have done my review, so I plan on reviewing the individual novels as they come into circulation. Michael C. Grumley has recently added book #5, Mosaic, to the Breakthrough series. Michael C. Grumley’s Breakthrough series is a unique scifi/technothriller series that focuses on technology that acts as a translator between dolphins and gorillas. The translator is a sophisticated computer system known as the Inter-Mammal Interpretive System or IMIS. The series also deals with aliens and, in fact, not one alien species but two. The first alien species was introduced in the first book, Breakthrough, and they came to planet Earth to steal some of our water as their home planet had become a barren wasteland. They didn’t mean to take much and thought they would get by without being noticed, but alas, when you fool around with Mother Nature things will go amiss, and they did. Luckily for us humans, a catastrophic event that was to take place as a result of pilfering water from the ocean was circumvented and as a result of this we got to make some alien friends. The second alien species actually visited plant Earth far in the past and left a little gift in the form of embryos of their species being held in some form of stasis. The novels Leap, Catalyst, Ripple and now Mosaic focus on this revolutionary find and what this might mean for us humans. There are a couple of plots going on at the same time in Mosaic. Li Na Wei, the only human that has been exposed to a ‘specialized’ bacteria that has ties to the alien embryos, is trying to deal with the results of her exposure to the bacteria when she is kidnapped by the CIA. Yes, that is right, the CIA. You would think that the CIA and the US military would be on the same team but in Mosaic that doesn’t seem to be true. Additionally, the team that was investigating the alien ship at the bottom of the ocean near Trinidad in Ripple, was attacked. One of the members of the team working on getting into the alien vessel became trapped inside and it is up to Alison Shaw and the dolphins to get him out. Mosaic ends with an interesting cliff hanger so it looks like we get to look forward to more of our dolphin friends, Dirk and Sally. Lots of action with good guys, bad guys, and interesting technology, Mosaic is a fun read. If you like animals, aliens, and fascinating technology then I think that Mosaic and the Breakthrough series will be for you. Though it is not necessary to read the whole series first, it would be helpful to read Catalyst and Ripple beforehand. To learn more about the series check out the Breakthrough series here. If you are the owner of A-Thrill-A-Week, or someone who enjoys this blog why not upgrade it to a Featured Listing or Permanent Listing?